Christmas Cookies: It's Never Too Early to Start Planning (and Pinning)! A) Weather in the South is not particularly cookie friendly. Most of the year it's just too hot to have the oven on for hours at a time, and who wants to get all sweaty making cookies? B) Cookies are not good for my waistline. I find it hard to get my walk in every day, and I don't need Mr. Cookie piling on when I'm not able to regularly burn him off. Just so you know that I'm not a complete "Debbie Downer" when it comes to cookies, I do embrace them during the Christmas season. The oven makes the house toasty and warm, and there's nothing better than a cookie and a hot cup of tea after being outside. In the pursuit of all things cookie-licious, I've started a cookie focused Pinterest board to collect some recipes and decorating ideas. 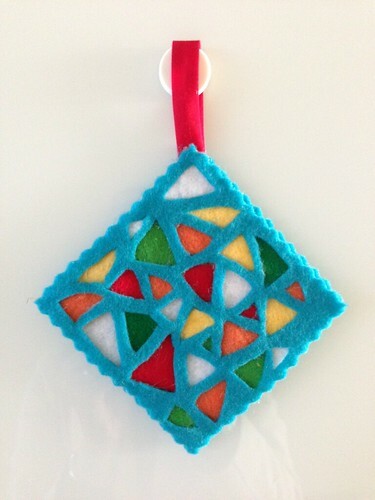 Now some, I will admit, are pinned just because I thought they were pretty (I'm no cookie Picasso! ), but some are very doable and might make it to my daughter's school this year. Here are some of my favorites! Must try for 2012 because I love the red color, red velvet, and crinkle cookies in general. These vintage Santas are so cheery. I could eat an entire box of spritz cookies...they're so good! This is my first of two letter-themed ornaments for the month of October. For this one, I pulled out a felted wool clutch from my discard pile (after it was felted, the handles were too tight) and decided to see what would happen if I cut it up. Turns out it makes pretty decent ornament material. I'd made the clutch with a combination of light blue and cream yarn, so the letter has a mottled look. 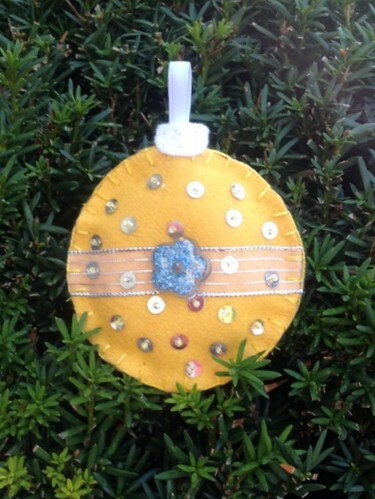 I added a blanket stitch around the outside and hung it up with the rest of my collection. **Please forgive the rusty flag bracket -- it was too windy to get a good shot of the ornament hanging on the usual evergreen tree in my front yard. I can't believe it's already late October! My collection of ornaments is growing rapidly, and before I know it, it will be time to put them on the Christmas tree. The ornament theme for October is letters -- monograms, text, writing, and more. It's Lucky Number 13! 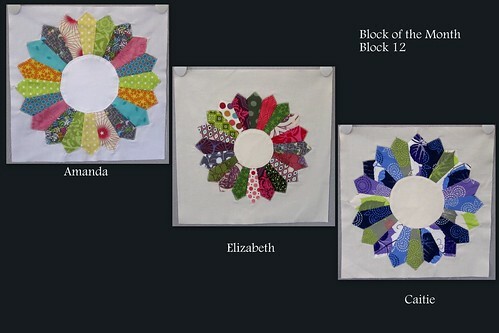 Our 13th block in the series is this great Modern Dresden Wheel. 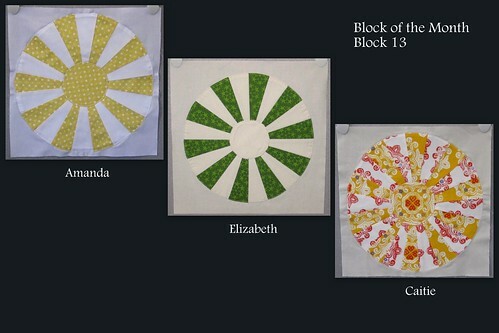 The straight lines really set it apart from the Traditional Dresden Plate that we made for Block 12. It's a nice clean design, but as you can see there's still some room for creativity -- Amanda used a yellow center for a sunny look, I went with a neutral center, and Caitie used prints throughout.